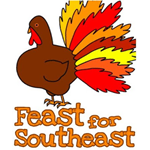 Feast for Southeast highlights community activism and the power of neighborhood partnerships that inspire us all to continue working to build stronger communities. Standing on the corner of Southeast Foster Road and 72nd Avenue, you can feel a steady breeze as cars pass by, many exceeding the posted speed limit of 35mph. A middle school age child dashes across the street on his way back from a convenience store. A speeding car screeches its brakes at the last minute and avoids hitting the boy. This scene plays out every day on Southeast Foster Road and group of neighbors is determined to change this by bringing a new vision to the busy arterial. Since it’s inception in 2007, On-The-Move Community Integration has created life changing experiences for both adults with special needs and the community volunteers who support them.